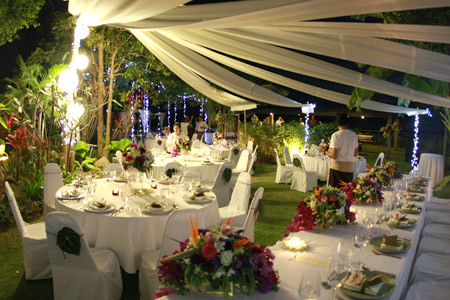 Why choose a Koh Samui villa wedding? Thailand is quickly becoming known as one of the world’s top destinations for couples looking to get married abroad, and the island gem of Koh Samui is one of the most popular spots in the Kingdom for weddings. 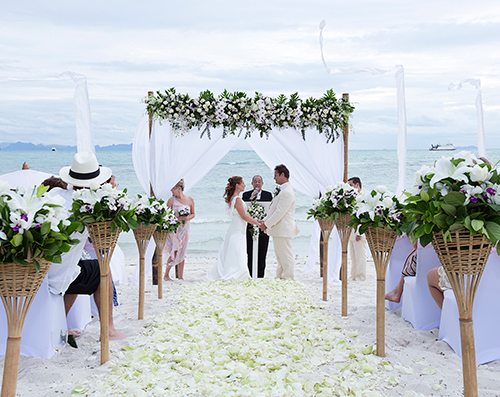 As well as being home to some spectacular natural scenery, Samui also boasts reputable agencies like The Signature Weddings who are able to tailor services to reflect the wedding day each couple wants. Many couples and their wedding guests also enjoy exploring the islands treasures as part of a larger vacation either before or after the wedding takes place. What is the best location on the island? Koh Samui boasts stunning natural scenery, from the lush tropical jungle of its hills and mountains, to the charming beaches that decorate its coastline. A large number of couples from around the world opt to live the exotic dream by tying the knot on one of Koh Samui’s idyllic beaches. This option guarantees wonderful photographs, with many beaches offering peace and tranquillity throughout the ceremony. Alternatively, couples that want to enjoy the island’s stunning views and sea breezes as they say their vows can get married in one of the island’s many secluded hillside villas. An increasing number of couples favour the idea of tying the knot within the exclusive surroundings of a private villa. Not only do villas guarantee privacy from other guests that would be staying at a hotel, but they often feature large communal areas that can be utilised by the entire wedding party throughout the celebrations. Couples and their guests can enjoy the wedding feast in the lush gardens of the villa, sip cocktails on the sun terrace and then party around the pool once the sun sets. Couples that book through a reputable agency can work closely with a dedicated wedding planner to ensure that once they arrive, they can relax in the run up to, and even during their wedding day. Details such as the food, decorations, schedule and entertainment can all be organised in advance. Couples can choose a Western menu, or opt for a rich selection of traditional Thai dishes, all of which are prepared by a professional chef. Sizzling seafood barbecues are also a popular dining option for couples getting married on Koh Samui. The island also boasts a range of entertainment choices, from DJs and live bands to traditional Thai drummers or dance troupes. Couples at a private villa can personalise the decorations, whether opting for traditional flowers, a seaside theme with seashell and starfish motifs or an even more creative design scheme. One of the main advantages of getting married in a private villa over a hotel is that couples are not restricted by hotel timetables and schedules, and are free to plan the day in a way that best suits their own wishes. That said, most couples tend to begin their wedding celebrations late in the afternoon once the heat of the sun has burned away. 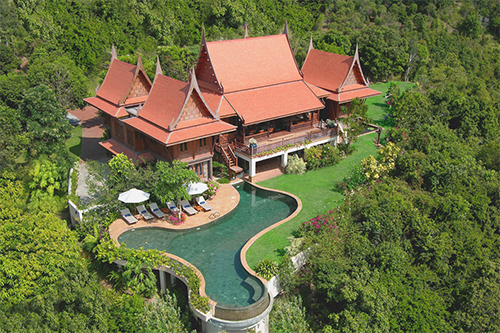 Guests who arrive at the villa can be served refreshing beverages and tasty Thai appetizers before gathering round for the ceremony. While many couples opt for a traditional Western service, some choose to have a Thai Buddhist ceremony, complete with chanting orange-robed monks. Once the ceremony is complete, the bride and groom can join their guests for cocktails and photographs at sunset, before enjoying a buffet dinner served at the villa’s outdoor dining terrace. Finally, a party around the pool, followed by a fireworks display and entertainment is a great way to round off the perfect wedding day.